SC Chairman Datuk Haji Mohd Nakhaie is currently the President of Islamic Dakwah Foundation of Malaysia . Graduated from Al-Azhar University in theology and philosophy, he also holds a master degree in Islamic history and civilization from Cairo University . Experienced in youth and student's movement for more than 18 years, Datuk Nakhaie also has more than 20 years experience in politics specializing in political information. He also has actively involved in many intellectual and political seminars, conferences and talks in Malaysia and abroad since 1965 as student leader, political leader and social activist. Datuk Nakhaie has written many articles on various areas of Islamic revealed knowledge in magazines and newspapers such as Islamic ethics, Islamic history and civilization, Islamic traditions in da'wah, ibadah and so on. SC MemberBefore being a rector of Islamic College of Darul Ridzuan, Datuk Yusoff was a mufti of Federal Territory for 2 years. 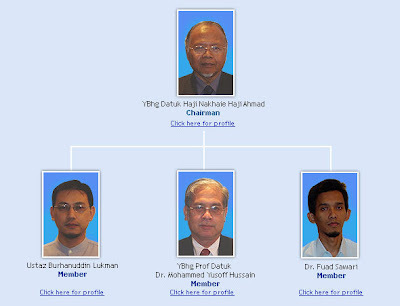 He was also a lecturer in Malaysian National University (UKM) for almost 30 years. He used to be the head of Department of Islamic theology and philosophy as well as the dean of faculty of Islamic studies. A lecturer in International Islamic University Malaysia (IIUM) since 1996, Dr. Mohd Fuad is currently Chairman of Shariah Committee for Bank Simpanan Nasional. After completing his first degree in Islamic Academy, University Malaya in Syariah Faculty in 1991, he obtained his second degree from University of Amman , Jordan in 1995. In 2004 he acquired Ph.D in Fiqh and Usul Fiqh from International Islamic University Malaysia writing a thesis on E-Commerce between Islamic and Malaysian Law. He also has written several books in Islamic jurisprudence such as Introduction to Study in Fiqh and so on. His working experience begins as Assistant Lecturer in Kulliyyah of Laws of IIUM in 1993 after graduation from Islamic University of Madinah. Ustaz Burhan then pursued his study in University Al al-Bayt, Jordan until he secured his second degree in 2000. He also holds Shariah Lawyer Certificate from Jabatan Agama Islam Wilayah Persekutuan (JAWI) in 2002. Ustaz Burhan is currently a lecturer in Kulliyyah of Laws of IIUM since 2000 while being a member of Shariah Committee in Al-Rajhi Bank Malaysia . He speaks fluently 3 different languages besides his mother tongue mainly; Arabic, English and Mandarin. 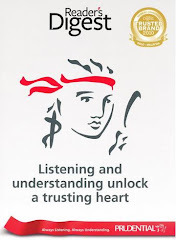 Saya adalah AGEN dibawah agensi Al Isra' Associates (Klang) Sdn Bhd yang mewakili Prudential Assurance Malaysia Berhad & Prudential BSN Takaful Berhad. Segala maklumat yang berada di dalam blog ini hanyalah sebagai penerangan ringkas dan berdasarkan pendapat peribadi saya. Ia juga bukan sebahagian daripada polisi. Saya dan pihak Prudential Assurance Malaysia Berhad & Prudential BSN Takaful Berhad tidak akan bertanggungjawab sekiranya terdapat salah faham dalam apa yang terkandung didalam apa yang saya sampaikan. Anda dinasihatkan untuk berjumpa terus dengan agen kami untuk mendapatkan penerangan yang lebih terperinci. Prudential Assurance Malaysia Berhad (PAMB) & Prudential BSN Takaful Berhad (PruBSN) merupakan anak syarikat tidak langsung Prudential Plc, sebuah syarikat yang diperbadankan di United Kingdon. Samada PAMB & PruBSN ataupun Prudential Plc tidak berkaitan sama sekali dengan Prudential Financial Inc, sebuah syarikat yang mempunyai perniagaan utamanya di Amerika Syarikat. Prudential Assurance Malaysia Berhad (PAMB) & Prudential BSN Takaful Berhad (PruBSN) merupakan anak syarikat tidak langsung Prudential Plc, sebuah syarikat yang diperbadankan di United Kingdom. Samada PAMB & PruBSN ataupun Prudential Plc tidak berkaitan sama sekali dengan Prudential Financial Inc, sebuah syarikat yang mempunyai perniagaan utamanya di Amerika Syarikat. All rights reserved. The images belongs to their respective copyright owners. Simple theme. Powered by Blogger.